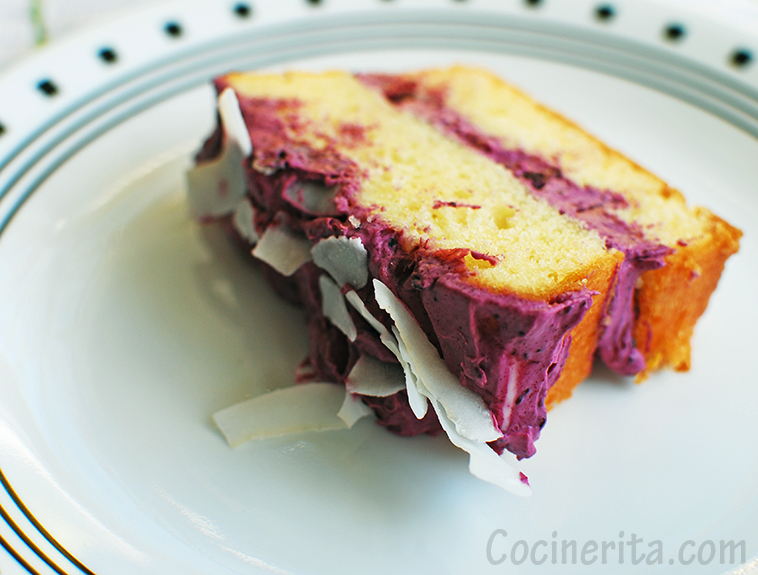 This is a basic recipe for a Mascarpone and Cream Cheese Blueberries Frosting. I also used the leftovers to make cheesecake truffles. I’ll probably make a parfait today with raspberries, whipped cream, pieces of leftover cake and this frosting. It might sound silly but I actually dreamed with blueberries this past Wednesday, so the next morning I went to the grocery store and bought a bunch fresh and frozen. I wasn’t feeling in the mood to bake a cake but I did want to eat some. I bought one of my favorite lemon pound cakes that has barely any icing and worked with it. Mascarpone and Cream Cheese work perfectly together for me. I didn’t add any sugar to this recipe since I wanted the tangy flavor of the blueberries to really come through the fat of the cheeses. I partially frosted the cake because I’m one of those people who remove half of the frosting when eats cake. I love frosting but a little bit goes a long way for me, I’m sure 15 year old JC would scream at 30 year old JC “shame on you!” haha, but oh well, I like what I like! 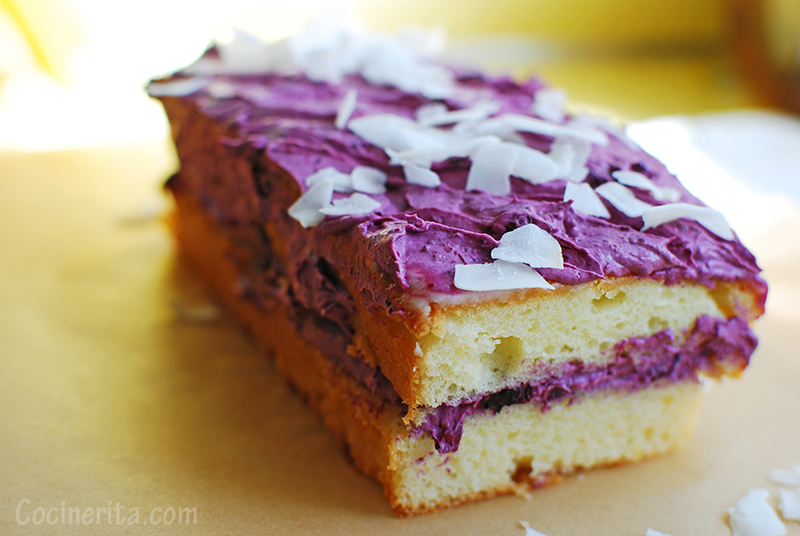 I served coconut shaves on top of this cake because I wanted a crunchy texture but without adding too much or taking anything away, the coconut shaves really did it for me and visually speaking it added a clean contrast to the beautiful purple icing. This is a good recipe for a Lemon Buttermilk Cake from Epicurious that you can use should you feel like baking to try this frosting! In a big glass bowl, mix the cheeses together with a spatula, once mixed, add the lemon zest and 1 tsp of vanilla extract. Chill in the fridge. Cook the blueberries in a pot with the lemon juice for 8-10 minutes in low-medium temperature or until the blueberries have almost broken down and reduced by a 25%. Before turning off the stove, add the remaining vanilla extract. 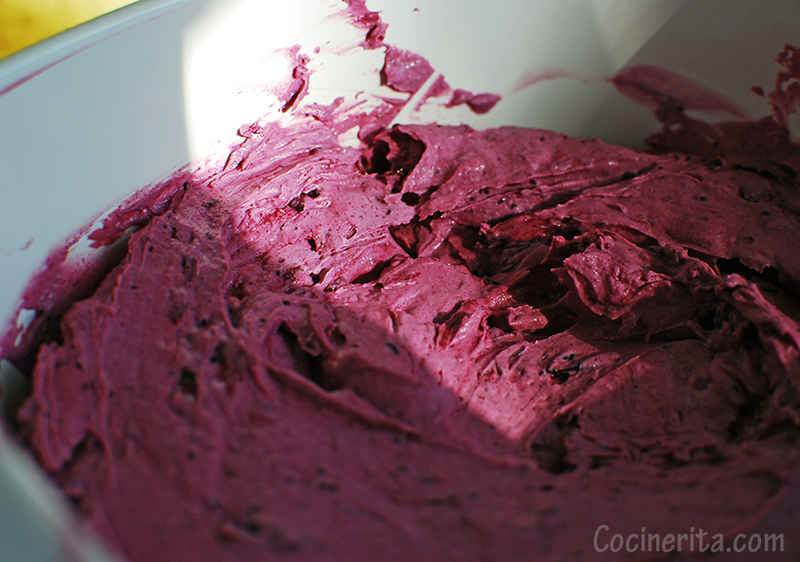 Chill the blueberries puree and once it has cooled off completely, mix it with the cheese mixture. 1- As you can see I’ve added no sugar to the frosting, so if you have a sweet tooth just make sure to add several spoonfuls of sugar to the blueberries in the pot, taste a lot and remember once it cools off it will taste less sweeter so adjust as you prefer.